July 24,2010 Joel B. & Friends Catch a Big Lake Bronze Limit!!! July 24,2010 Joel B. & Friends Catch a Big Lake Bronze Limit!!! We had to do some looking and it took some trying for Joel and his friends but finally we got on a nice school of reds and it was a fish on almost every cast untill 2 pm. We finished the day with a nice limit of Big Lake Bronze Beauties on live shrimp. Plus a dozen nice trout and one Flounder. 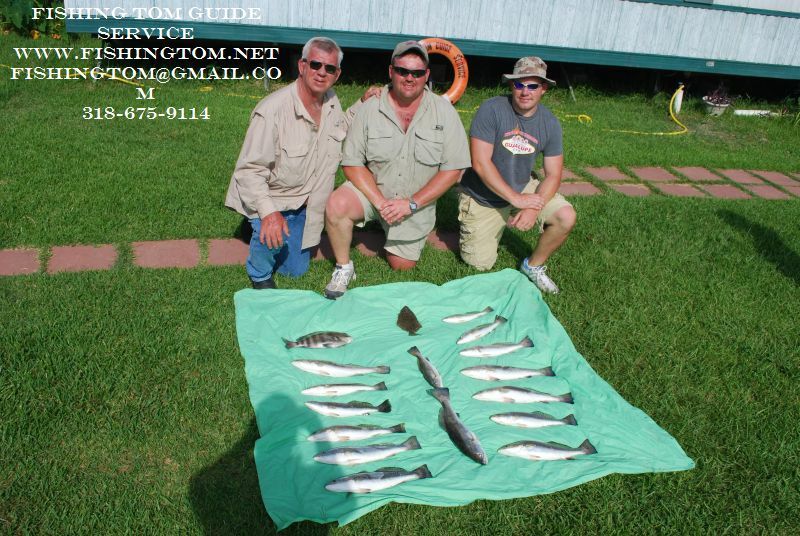 July 23, 2010 Casey K. & Friends Catch a Big Lake Bunch of Fish!!!! 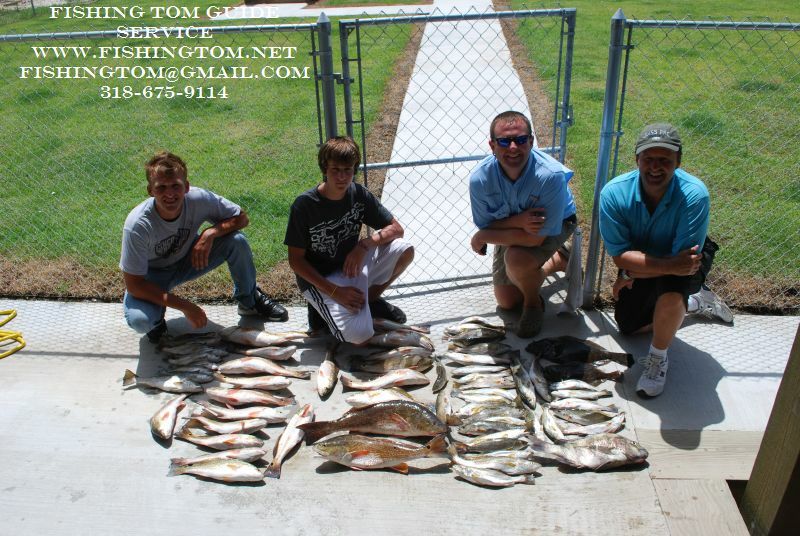 July 23, 2010 Casey K. & Friends Catch a Big Lake Bunch of Fish!!!! It was a great day for Casey’s friend Mike & sons Jon & Nick. It was almost non-stop action. We had a limit of 20 Reds buy 9:30am and headed down the main lake and found a nice group of birds we worked for almost 2 hours and put 45 nice trout in the cooler on Gulp Swimming Mullet. We left the birds still working to go try for some flounder. Nick latched on to a really nice Big Lake Beauty about 4 pounds! 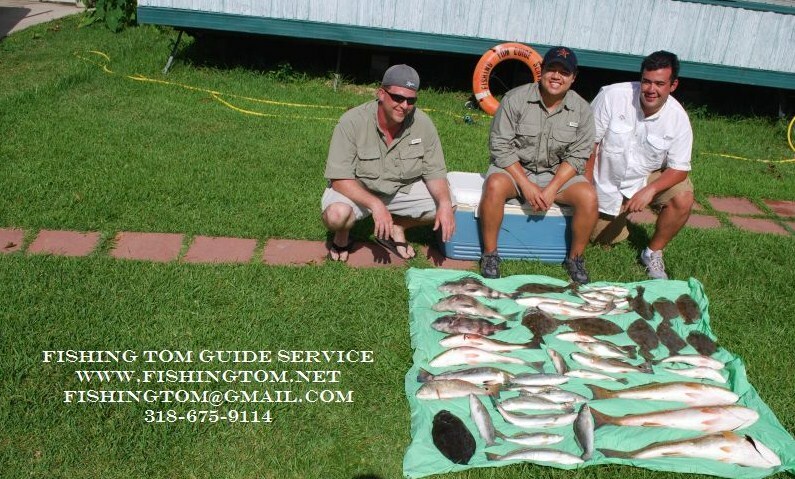 It was their first trip to Lake Calcasieu and one to remember!!!! July 20,2010 A Great Trip to Big Lake for Albert, Hector & Seth From Austin Tx.!!! July 20,2010 A Great Trip to Big Lake for Albert, Hector & Seth From Austin Tx.!!! 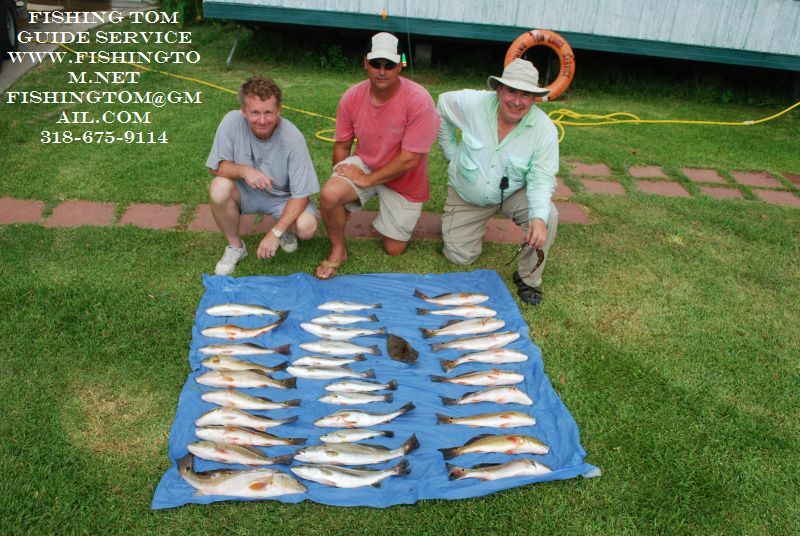 Live Shrimp was the weapon of choice to overfill the cooler with BIG Reds , Nice Flounder,Trout and Seth’s Sheephead!!!! We had several more nice 10 to 15 pound Reds on but got broke off and humiliated by these Lake Calcasieu brusiers. They said it was well worth the ride from Austin and will be back in the fall. July 17, 2010 Buddy H. and Sons Mathew & Jonathon Visit Big Lake for First Time!! July 17, 2010 Buddy H. and Sons Mathew & Jonathon Visit Big Lake for First Time!! Live Shrimp was the bait that helped these guys have a great time filling the cooler with Lake Calcasieu Trout, Reds & a Flounder to boot! 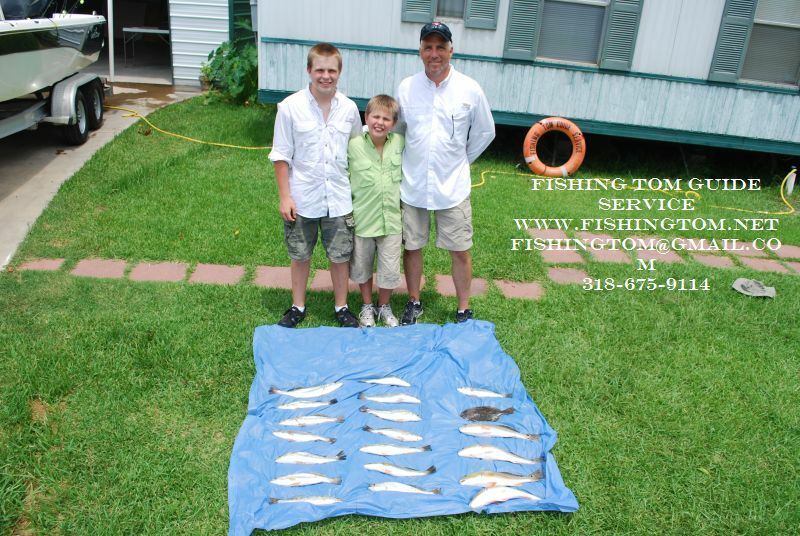 July 16, 2010 Ryan F. with his Father and Friend Jarrett Catch The Big Ones on Lake Calcasieu!!! 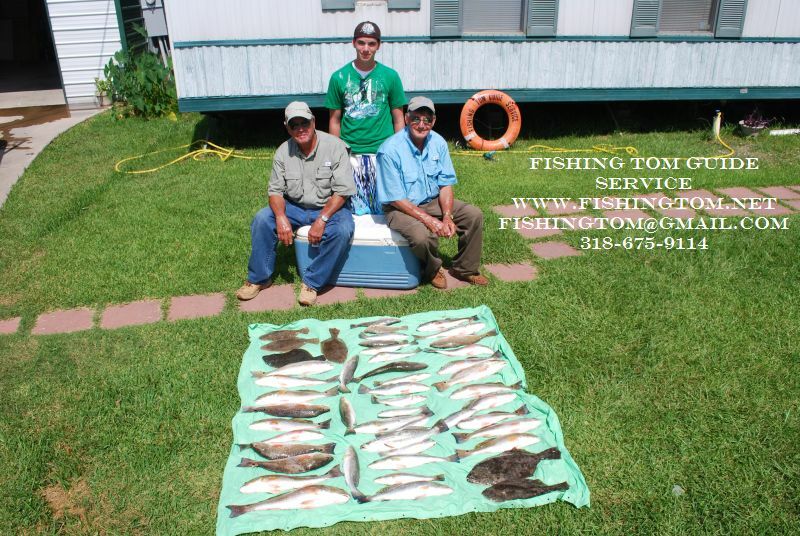 July 16, 2010 Ryan F. with his Father and Friend Jarrett Catch The Big Ones on Lake Calcasieu!!! The Sheephead and Flounder look like midgets next to thse nice Big Lake Trout that Gulp put in the cooler today. We had to work hard and travel a bit to catch these quality Specks but it was worth it! July 15,2010 Earl G of Homer La. And Brother Ray & Grandson Seth have a Great Family Big Lake Outing!!! July 15,2010 Earl G of Homer La. And Brother Ray & Grandson Seth have a Great Family Big Lake Outing!!! Earl was down about 6 weeks ago and had such a great time he came back and brought his brother Ray and Ray’s grandson Seth. Earl started the day hot on Gulp but soon Seth and Ray were filling the cooler on Live Shrimp and Earl soon Converted to Shrimp to End the day with a Limit of Reds and a Nice Mess of Lake Calcasieu Trout and Flounder to Boot!!! They are allready booking their October Trip!!! !